To prevent future conflicts, Russia and the West should agree on new rules of engagement. The debate over European security turns on the different ways Russia and the West interpret NATO’s expansion. These interpretations, for their part, are rooted in the different ways the parties view the end of the Cold War. According to Russian leaders, the Cold War ended as a result of the joint efforts of the Soviet Union and the United States in the late 1980s to move from a relationship based on confrontation to one focused on cooperation. After the agreed-upon end to confrontation, the Russians expected the sides would jointly determine the future of the areas where their interests overlapped, primarily European security. The main issue to be decided was the future of NATO, which had been established as a counterbalance to the Soviet Union. In the late 1980s, during talks on the future of Germany, the subject of how German reunification would affect NATO was frequently discussed. As part of the discussions, the Soviet Union agreed not to oppose German reunification and NATO member states agreed not to deploy the alliance’s military infrastructure in East Germany – an agreement they honor still. However, there was much debate as to whether the agreement not to expand eastward would apply only to East Germany or to Eastern Europe generally. According to the personal notes of U.S. Secretary of State James Baker, the subject was discussed in a conversation with Soviet leader Mikhail Gorbachev in Moscow in February 1990. But Baker’s notes are inconclusive as to how the parties left the issue. What can be said is that despite the fact that the Soviet Union was clear in its adamant opposition to NATO enlargement, no agreement guaranteeing that there would be no expansion was signed. During the discussions in 1989-1990, the issue did not come up because the Warsaw Pact was still in place. However, starting in 1991, the Soviet Union lost control over the events in Central and Eastern Europe. Communist governments fell, the Warsaw Pact dissolved, and the West had no impetus to engage in any negotiations or agreements with Moscow. Motivation to negotiate with Moscow further decreased with the breakup of the Soviet Union. Under Boris Yeltsin, Russia not only set aside Soviet demands for guarantees that NATO would not expand, but even toyed with the idea of joining the alliance itself. In 1990, Yeltsin, then chairman of the Russian Supreme Soviet, wrote: “In what appears to be almost a mockery of our four and a bit years of perestroika, in a matter of days, the GDR, Czechoslovakia, and Bulgaria made such a leap from the past towards a normal, humane, civilized society that it is no longer clear if we shall ever be able to catch up with them.” These words explain why Russia was so tolerant of former Warsaw Pact members’ aspirations to join NATO. For their part, members of the North Atlantic Alliance perceived the situation as a clear victory, and put forward a program to turn the bloc into a universal security organization. In this context, Russia lost its status as an equal partner and became, as far as NATO was concerned, just another country that the alliance would deal with on its own terms. From these beginnings grew profound imbalances in European security, which caused ongoing disagreements between Russia and NATO starting from the mid-1990s. Over time, omissions and reticence led to a complete breakdown of understanding between the parties. In effect, the West failed to create a coherent and purposeful policy for working with Russia. It was customary to believe that Moscow was moving toward the West, and therefore the West could not do Russia any harm by acting unilaterally. While the goal of this policy was not to ignore Moscow’s interests, in practice, that was exactly what it did. This approach did not change, even after the first serious disagreements between Russia and NATO erupted during the conflicts in the Balkans. At that time, the West acted unilaterally on its own interpretations of how to ensure European security, which included expanding NATO and deploying U.S. missiles in eastern Europe. When Russia balked at these moves, Washington and Brussels responded that Russia could also take whatever steps it felt were necessary. The West was not concerned with the corresponding steps Russia was taking to strengthen its own security because it believed that Moscow was not an adversary and did not represent a credible threat. The widely held belief was that while Russia wanted equal partnership, it was not an equal partner. A divergence of interests prompted Russia to reassess its priorities in its relations with the West. Moscow’s hopes to establish a new world order on equal terms with all parties remained unfulfilled. 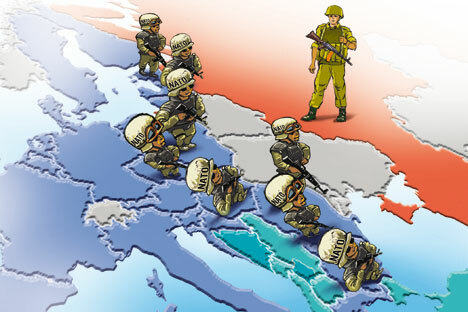 On numerous occasions, the United States and NATO unilaterally used force in conflicts. Russia’s independent foreign policy, aimed at ensuring its own interests, met with increasing criticism in the West. The Ukrainian crisis is just the latest example of Russia and the West’s failure create a post-Cold War world order. To prevent future conflicts in Europe, Russia and the West should agree on new rules of engagement, both in Europe and in the rest of the world. Andrey Sushentsov is an associate professor at the Moscow State Institute of International Relations (MGIMO) and a Valdai Club fellow.